Had another piano lesson yesterday - I seem to be making good progress. When I started these lessons I was worried the teacher would try and take me back to basics and have me playing really simple stuff but not so - she's asked me to have a go at a Rachmaninov prelude which I think is more difficult than anything I've tried so far, but she thinks I'll be able to do it. I'll post a video when I can. Whenever I travel across to England to teach on a course, or attend a conference, I inevitably hear all about the problems in the NHS over there. We're lucky on the Isle of Man that we don't have the same level of political or management interference as they do over there. Here's an example. The 18 week rule was brought in to ensure everyone gets quick treatment. However, what they don't advertise is that if someone 'breaches', then a miss is as good as a mile. A patient was recently listed for a hip replacement at a large Mersey region hospital. A manager there found he was after the 18 week limit, and promptly cancelled his admission so that another patient could be done in his place who hadn't breached. As far as the rules are concerned once he's waited 18 weeks and a day, he may as well wait for 3 years - the figures look equally bad once collated as required by the government. I find it unbelievable that clinical priorities and fairness can be distorted in this way. There are many other examples involving the 'choose and book' system, or the 'pre-appointment physio triage' system. I'm glad we don't have these set-ups here. 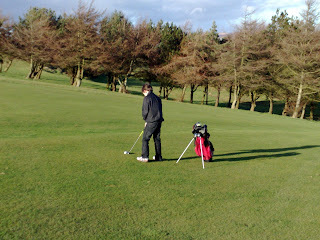 Played 11 holes today at Douglas with William. Had my best round ever, starting with a genuine birdie at the 1st (genuine as in no 'practice shots', and no mulligans), and a handful of bogeys. No disasters - worst was an 8 on the usually uncomplicated 5th, all down to my poor bunker technique taking 3 shots to get it out of the sand. If my performance over the 11 holes is extrapolated to a full round I'd justify a 22 handicap or thereabouts. Definitely felt like I'd made some progress today. William did OK. Like every single golfer in the world he can get frustrated if shots don't go well, but his drive on the 10th made up for it all - about 150yds straight down the fairway. I was envious after I hit mine about 160yds, into the rough on the left. 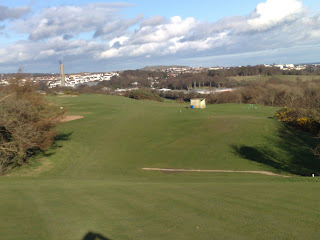 Photo is looking back down the 5th fairway. Beautiful day today for golf. Spring, hopefully, has finally sprung. I'm an orthopaedic surgeon on the Isle of Man, with an interest in spinal disorders. I'm married to Christine and we have 3 children - Tori, William and Sophie.